Along with Paco de Lucia, Gerardo Nunez and Chano Dominguez, Perico Sambeat is one of the great figureheads of Spanish jazz. Outside Spain little is known of the recordings he made in 1993 and 1995 with Brad Mehldau, Mark Turner and Kurt Rosenwinkel. Though from the mutual appreciation that these musicians have for each other has evolved a close friendship. Most recently many have become aware of the vivid, powerful playing of saxophonist Sambeat through the recording Jazzpana II (ACT 9284-2), acclaimed by critics and public alike in a brilliant line-up based around guitarist Gerardo Nunez. With his exceptionally elegant and sinuous phrasing (also in duet with Michael Brecker), Sambeat plays an important role in bringing the fusion of jazz and flamenco to a high performance and compositional level. On his ACT debut as leader, Sambeat takes a totally different stylistic direction. And particularly notable is the list of musicians with which the Valencia-born alto/soprano saxophonist has surrounded himself: Brad Mehldau on piano, Kurt Rosenwinkel on guitar, Ben Street on bass and Jeff Ballard on drums - as well as the melting voice of Carmen Canela singing in Portuguese on one of the tracks..
His top-notch partners allow Sambeat to show off his outstanding credentials. His notable and unique stylist Brad Mehldau emphasizes Sambeat’s "great sound" on the saxophone and the "valuable musical challenges" of his various projects. Guitarist Kurt Rosenwinkel, one of New York’s shooting stars of recent years, explains his enthusiasm for working on this project in simple terms, "because it is always a pleasure to be involved with Perico’s music". 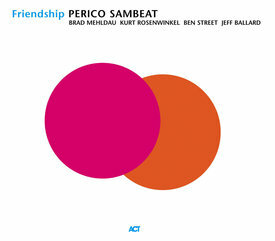 The CD "Friendship" consists of nine Sambeat originals and one evergreen. Sambeat interprets the ballad "Crazy She Calls Me", definitively associated with swing legend Billie Holiday (in her case of course it took the title "Crazy He Calls Me") with exquisite calmness, nestling in harmonies that dramatically extend the boundaries of the chorus. Sambeat’s own compositions show him to be a clearly unrestrained craftsman at the height of his powers. Above all, the rhythmic and harmonic sophistication of the opening number "Memoria de un Sueno", and of "Bioy" and "Icaro" reveals the composer to have mastered an organically flowing style that is full of subtly controlled contrasts. The solo parts of Sambeat, Mehldau and Rosenwinkel seem to grow out of one another. Also while the leader’s saxophone (usually the alto) remains in the centre for most of the time, through every bar a strong communicative energy can be felt. The many rhythmic interjections of Chick Corea’s drummer Jeff Ballard alone sustain a virtuoso background commentary. Sambeat’s original material presents many challenges to the other musicians. While they tend towards the mainstream, none can be written off as typical. Stylistic approaches such as the pregnant ostinato figures of the piano in "Orbis" make clear the band leader is a writer of quiet unconventionality. Sambeat has stimulated his world class partners to play their best while keeping an ear open to the music’s subtle dynamic range. "Friendship" is exactly the right title for this CD reckons guitarist Kurt Rosenwinkel: and the friendship is equally valuable for all involved, as is clearly apparent from these tracks. The musicians perform superbly on a CD with many fine facets, leading one to find something new on every hearing. "Friendship" also is the art of understatement, never displaying its quality in a showy manner.And therefore this album of Perico Sambeat has all the requirements necessary to make it an outstanding addition to the ACT catalogue.